This isn’t the first time the 18th century folk song Maggie May has been used as the basis for a musical – Lionel Bart tackled it in the 1960s – but Bob Eaton and Sayan Kent’s new version plants it back in the heart of the city that spawned the legend. This is a departure from the style of riotous Scouse comedy the Royal Court usually produces, but it has the people, places and history of Liverpool running through its veins. The story has been moved forwards 150 years or so from its origins into the early 20th century. This allows for a degree of social commentary that resonates with the present day. 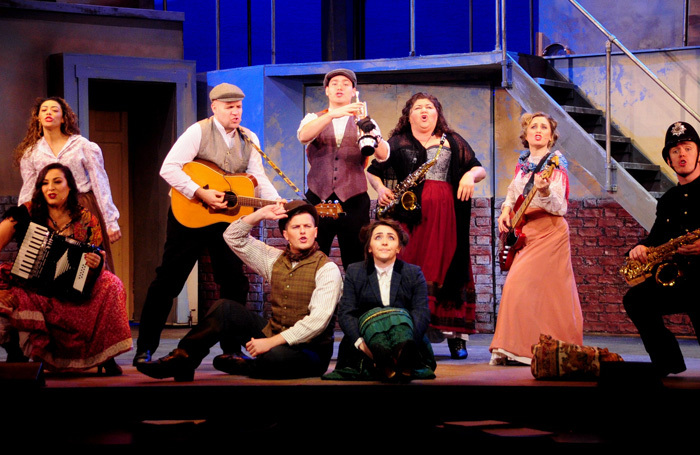 The musical explores strikes, riots, poverty – and the formation of the Liverpool Pals Regiment. Eaton, who has been working on this show for a decade, uses his trademark approach of working with a cast of actor-musicians, all of whom deliver consistently strong vocals while capably playing Kent’s rollicking, folk-influenced score. Christina Tedders is magnificent as Maggie, the girl from Dublin who falls on hard times in Liverpool as she tries to make her way to America. Her fluctuating fortunes and tempestuous love life, set amid the turbulence of the times, make for something that reads almost like a Liverpudlian Les Miserables. Mostly sung through, the show keeps itself in constant motion, with Foxton’s ingenious set employing the Royal Court’s newly restored stage revolve. The production boasts a strong narrative, and some real showstoppers, but most of all, it has heart.